Panchgavya Panchakarma is designed for treatments of skin diseases, obesity and mental issues. 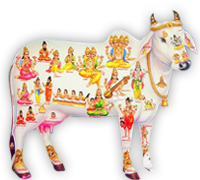 Panchagavya is a group of derivatives of 5 elements obtained from Cow i.e. What Ayurveda Science say about Panchgavya ? Panchagavya is called Sanjivani, means one who give new life to the body it also called Amrita, which mean it is a nectar for life. How it is effective in Skin problems, obesity and mental problems ? Panchakarma by Panchagavya results in deep cleaning of each cells of human body.Expel out the root cause of disease, opens all obstruction from the system and metabolism improves, hence dissolve and expels the extra fat from the body and control the body weight. It improves hunger and digestive process. The removal of slow poisons from the body, and gives a new life force energy to the body and mind, skin becomes clean and healthy, ayurveda has the cure for leucoderma and psoriasis kind of disease. Pimples, skin allergies, are very effective to cure with Panchagavya Panchakarma therapy. Mental and psychological problems could be treated with Panchagvya Panchakarma, cow ghee is the best medicine for mental issues, we use Cow ghee for Panchakarma for mental problems.